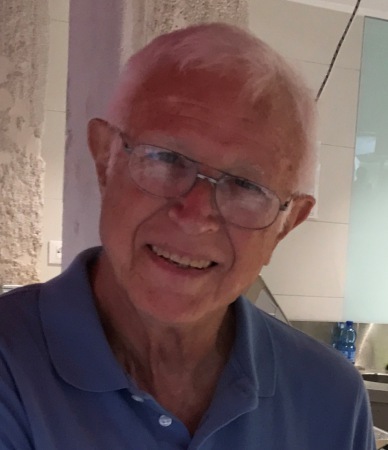 John C. Petry, age 79, born April 20, 1939 passed away November 30, 2018. He passed away peacefully and honorably, holding a rosary, with Sonya, his wife of 56 years at his bedside, and his children nearby. Born to George and Mabelle in Cleveland, Ohio, he was a 1957 graduate of John Marshall High School and a 1961 graduate of the Cornell University School of Hotel and Restaurant Management. He managed Stouffer Hotels and the Catawba Island Club, before opening and owning his own restaurant in Findlay, Ohio from 1977-1995 named Way Back When. With his wife Sonya, he also co-owned Bread Kneads Bakery in Findlay from 1980-1996. In 1996, he and Sonya moved to Rocky River, and owned a Surface Doctor franchise for 10 years before retiring. He is survived by his beloved wife, Sonya (nee Hoene), his 6 children: Kerri Smith (Jim) of N. Royalton, Jodi Buchholz (Rick) of Spring Valley, MN, Lori Digges (Randy) of N. Olmsted, Wendi Jenkins (Todd) of Columbus, Kristin Pullin (Brian Lantz) of N. Olmsted, and Matthew Petry (Melissa) of Cincinnati, and 17 grandkids: Kevin (Amanda), Greg and Rachel Smith; Adam, Zachary, Lauren and Ellie Buchholz, Eddie and Tyler Digges, Seth (deceased), Claire, Grace and Maren Jenkins, Alex and Sarah Pullin, and Will and Grant Petry. Friends and Family may call from 6-8 pm Thursday at JENKINS FUNERAL CHAPEL 2914 DOVER CENTER ROAD WESTLAKE. Mass of Christian Burial to be held Friday December 7 at 11:00 am at St. Bernadette Catholic Church 2256 Clague Road, Westlake, Ohio. A lifelong summer frequenter of Isle St. George, Ohio, in lieu of flowers, memorial donations can be made to the North Bass Island Chapel, Isle St. George, OH 43436. Private burial services at a later date. While I only met him once or twice, I can see Wendi, especially from this photo here, that you have inherited his brightness and cheer. I am sorry that you, and your girls, will no longer have his wisdom to guide your steps as you walk through this world. I pray that you and your family will be blessed with the peace that passes all understanding. God bless you Sonya and the entire Petry family. May you find comfort seeing John live on through Will and Grant and your son Matt of course as well as your daughters and all your other grandchildren. It was a privilege knowing John. I smile just thinking of him. To honor him we will send a donation to North Bass Island Chapel. My condolences on the loss of your father. Every time I was in his presence he was kind and considerate. One measures a man by the family he raises. Your father must have been awesome! Take care and God bless.